Are cylinder sleeves bad for your BMW engine? There seems to be a bit of controversy surrounding cylinder sleeves and BMW engines. Oil consumption, excessive noise, sleeves dropping, Alusil blocks not liking sleeves – you name it. I took some time to talk to our machine shop foreman, (the man with 50 years experience) Tony (VAC owner) and our manufacturing partners (Darton and LA Sleeve) about the drawbacks of using sleeves in the S54, S62 and S65 engines. Short answer: There are no drawbacks. Long answer: I can say with absolute confidence that properly specified sleeves installed properly will work flawlessly and offer more durability than a non sleeved block. Track builds, street builds, stroker builds, big HP forced induction builds – not a problem. We have sleeved dozens of BMW engines in our machine shop and sold 100s of BMW sleeves to machine shops all across the world. We always have a few shelves full of BMW sleeves ready for shipment. “The only drawbacks we are aware of are poor installation practices. It’s the primary reason for almost every issue possible. Let me address that first: by adding a foreign object to the block, which had nothing in it to start with, logic would say the block has been compromised. That can be true if done incorrectly. Oil consumption is a myth. In many cases, oil consumption will increase as a result of sleeves because of an incorrect hone pattern. But, noise isn’t a myth. If the sleeves are installed with too much piston to wall clearance, it usually sounds louder during warmup. It sounds louder as a result of iron lining the cylinders. Only way to prevent that is to watch the piston to wall clearance during the honing of the sleeves. For all builds, we take it one step further by using flanged sleeves, built to our exact specs. These flanges assure that the sleeve will not ‘drop’ under any circumstances. See pics below. “When some mechanics or engine builders look at the deck of the S65, they think there’s no room to put sleeves. 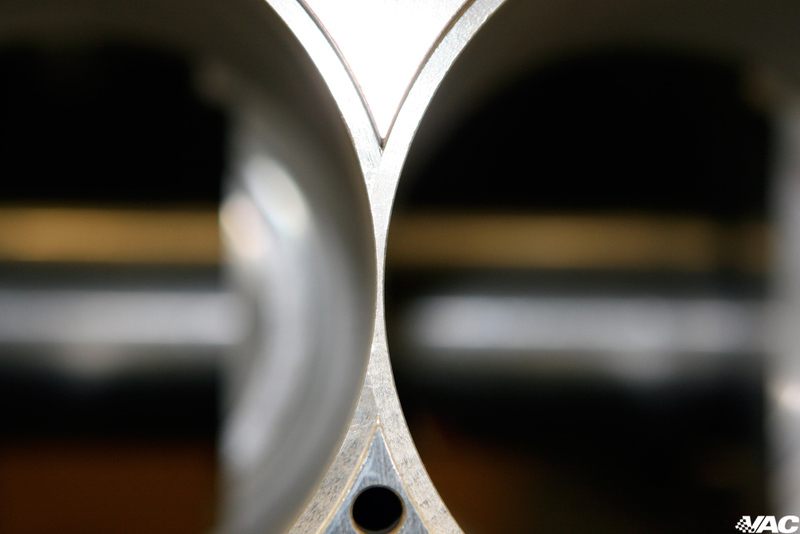 Although the S65 does not have thick walls in between cylinder bores, it does have one good quality – hard aluminum. If the sleeves are installed properly, the block looses no structural integrity. Meaning, the performance sleeves are quite thin, but radically stronger than the S65 aluminum. Therefore, by installing the thin wall sleeves properly, the great S65 block is now much more receptive to higher volumes of boost than the S65 alloy can handle. 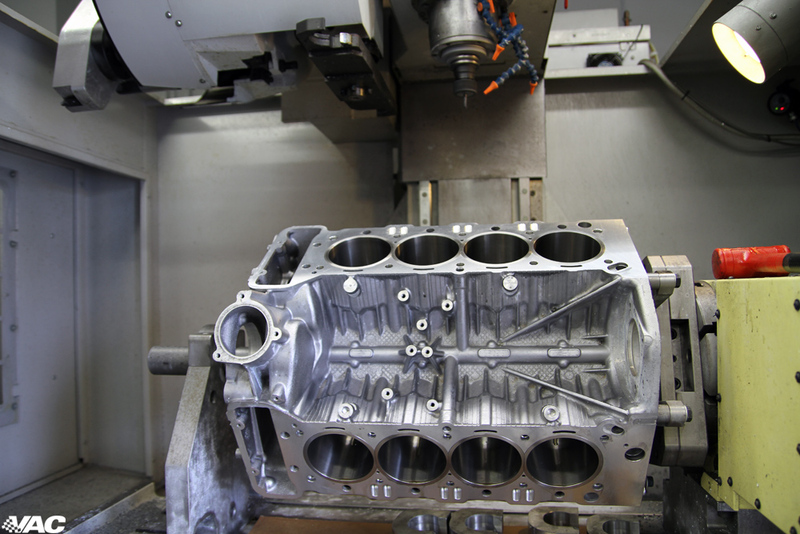 By simply lining the block with the thin wall, centrifugally spun-cast ductile iron sleeves, the cylinder bores can handle 50% to 70% more boost than that of the Alusil aluminum bore block. The boost can care less what pistons it runs with in most cases. 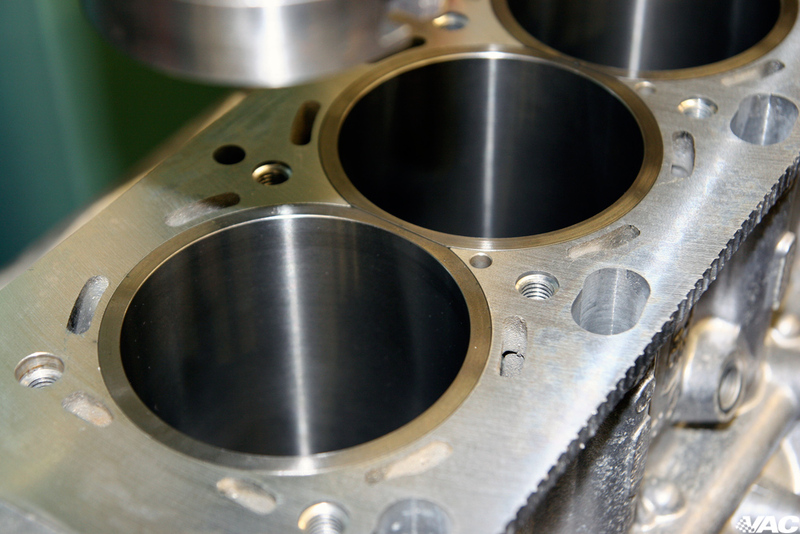 It’s the cylinder block walls that are compromised first, not pistons. 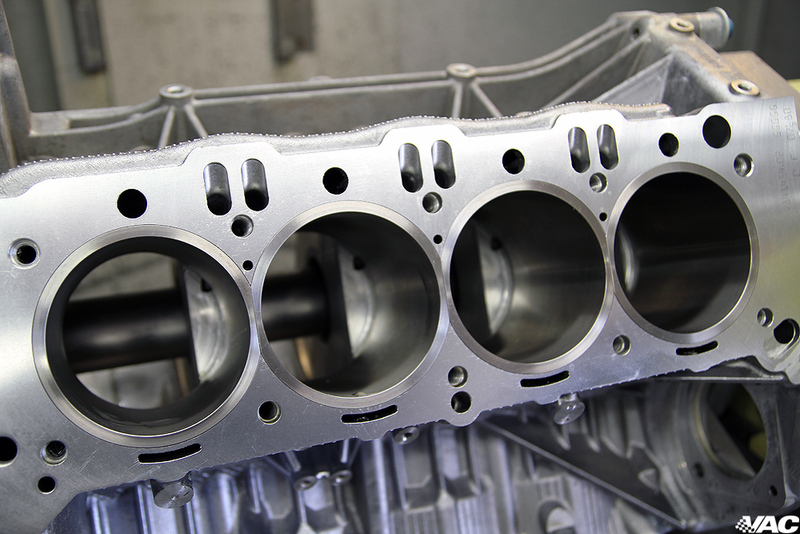 If the S65 block aluminum is poor, it will fracture the block well before the pistons fail. That’s why we like to re-sleeve these alloy blocks ductile iron material. Not to save the pistons, but so the block can hold compression so the pistons do their job properly. 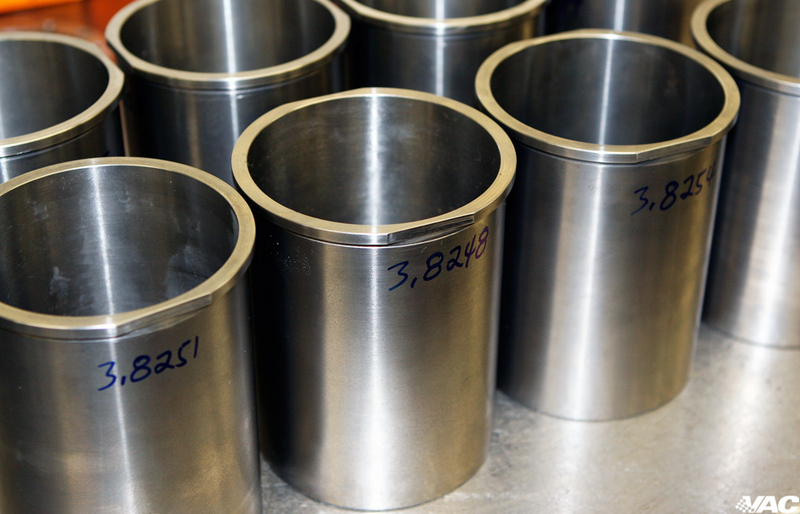 There are several reasons for using cylinder sleeves. Most commonly they are found in manufactured aluminum blocks because as you know aluminum does not have the wear or sealing properties needed unless it is coated. Yes, we sleeve Alusil engines with confidence. There ya have it – direct quotes from BMW engine and sleeve experts. Please visit us at 2515 Snyder Ave to see well over 1/2 million dollars of BMW engine components on our shelves. 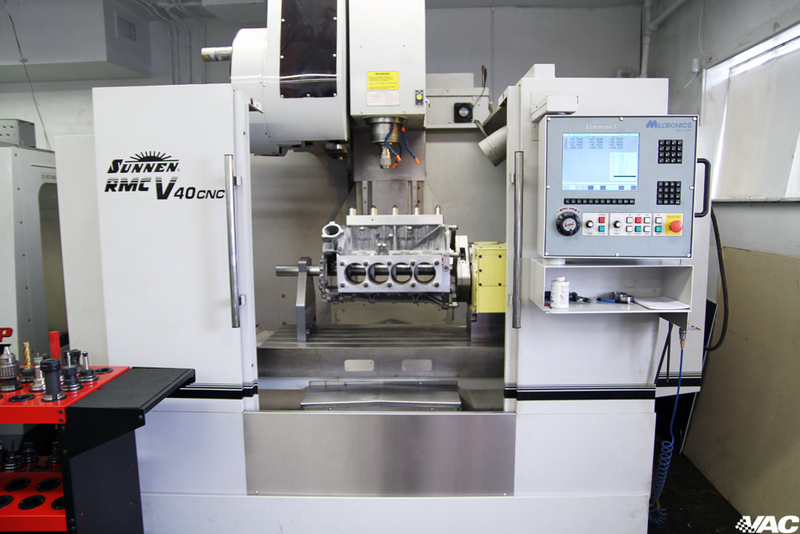 You will also see a few million dollars worth of the best machine shop equipment available. Flanged sleeves, made to exact VAC specs are measured before machine work starts. 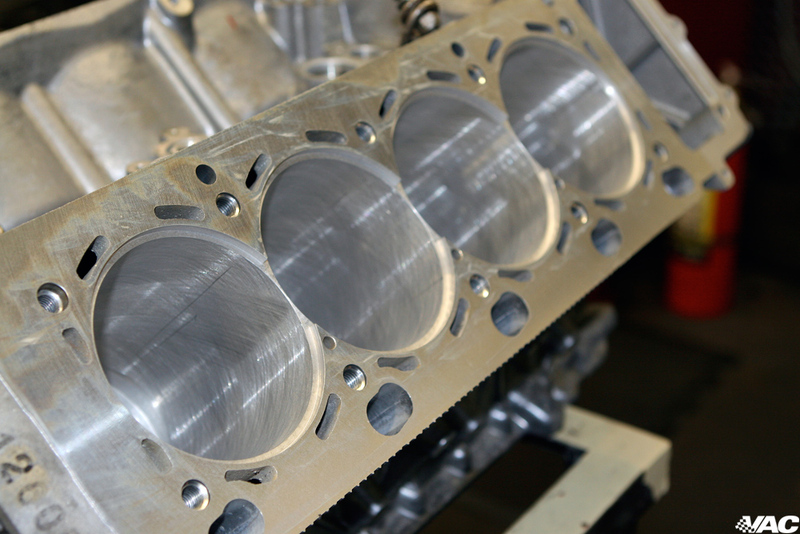 S62 block is honed and ready for the flanged cylinder sleeves. Very precise machine work is standard at VAC. Flanged sleeves are installed in the S62 block ready to be honed. S65 sporting VAC specified Darton flanged cylinder sleeves. Sleeved S65 on our RMC V40 machine.